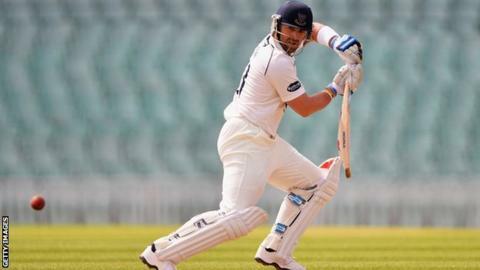 Sussex captain Ed Joyce says Matt Prior has moved on from the controversy over his dismissal against Middlesex. The England wicketkeeper was given out on Thursday, briefly staying at the crease, gesticulating that the ball had bounced before Sam Robson caught it. "We felt there was a clear case against the catch," Joyce told BBC Sussex. "But it happens - Matt's totally fine now. "Eventually you come round to the right decision which is that you have to take the fielder's word for it and move on." Prior had been at the wicket for 40 minutes for his 10 runs when he nudged at a ball from off-spinner Ollie Rayner. Robson, who was fielding at silly-point, appealed for the catch - and Prior was duly given out. "To put it mildly, Matt wasn't sure the catch was taken," said former Middlesex batsman Joyce. "But he's talked to some of their players about it, and to their director of cricket, and we've all moved on. "I don't think it was a case of kiss and make up, but Matt just wanted to explain himself. "He stood out there and made a bit of a scene and obviously you don't want to see that sort of thing in professional sport but he felt strongly about what he saw."